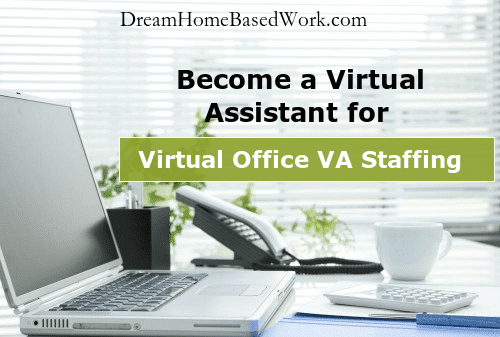 Virtual Office VA is a staffing company that works with virtual assistants/administrative assistants as independent contractors. This company offers work from home jobs for those that reside in the US and Canada. What type of work is involved at Virtual Office VA Staffing? Generating leads is a big part of the position with Virtual Office Va so, while you are not selling, you should be comfortable cold calling potential customers to gather information. What is the Pay at Virtual Office VA Staffing? The starting pay rate is around $9-$10 per hour. You are able to get paid once a week via paypal. You can be flexible with your schedule as long as you are available during working hours to respond to and engage with your clients. You must have high speed internet and a solid phone line or dependable cell phone with unlimited minutes. Other required skills include a good phone communication skills, knowledge of Word and Excel, and some past office experience. Clients are mostly in the real estate industry making any experience in that field a plus. How to Apply with Virtual Office VA? What other companies contract Virtual Assistants to work from home? Zirtual hires remote workers based in the US only, to work from home as Zirtual Assistants. Your job duties include internet research skills , problem solving skills, familiarity with standard assistant tools like Google Docs, Microsoft Word, Excel, Outlook, etc. Pay is around $5-$20 per hour based on your experience. Worldwide 101 is an international virtual support company that contract workers in North America and Europe. You must be experienced and a reliable professional. Assistant Match hires part-time virtual assistants to work from home. You must already have an established virtual assistant business. Pay is around $12-$15 per hour for general work and $20-$25 per hour for writing, graphic design, and technical. Good Luck to all those who apply!